This week’s charts use participant record data from the Export-Import Bank to display the Bank’s top exporter beneficiaries in general and for each financial vehicle the Bank offered for FY 2013: loan guarantees, insurance coverage, direct loans, and working capital guarantees. 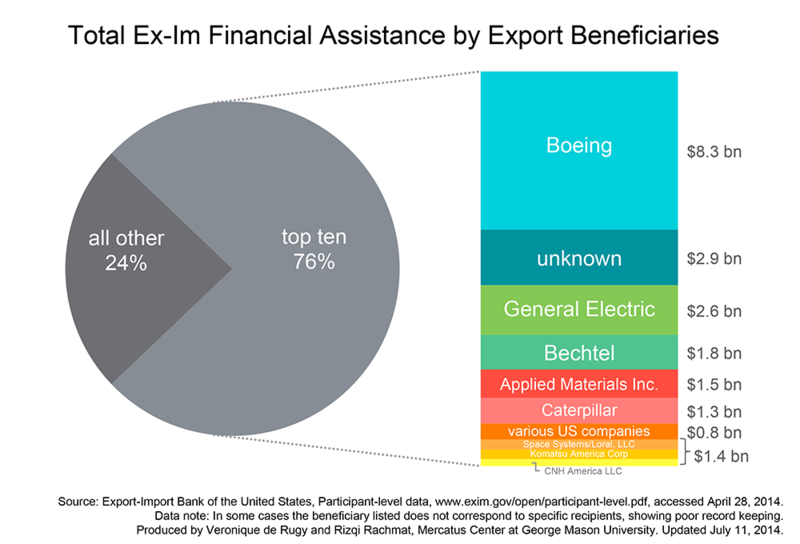 The charts show that the Export-Import Bank’s top beneficiaries constitute a large portion of total financial assistance—and therefore have plenty of reasons to support the upcoming reauthorization. The charter authorizing the US Export-Import Bank, a federally owned export credit corporation, is set to expire on September 30, 2014. Economists, policymakers, and commentators have long understood the many flaws of government-subsidized export schemes: They are unnecessary, inefficient, and unjust. However, the Bank continues to be reauthorized by Congress every five years. To provide an accurate picture of total benefit levels for each exporter, the Export-Import Bank’s data required additional formatting. First, we combined affiliate or subsidiary companies, such as “Boeing, Inc.” and “Boeing Satellites,” into parent companies to reflect total corporate benefits. Next, typos or inconsistencies in the Bank’s data—for instance, separate records for the same company listed as both “Acme Corp” and “Acme Corporation”—were corrected to provide accurate estimations of total Export-Import Bank support for each exporter. Given the size of the dataset, it is likely that a handful of exporters were not combined as they should have been. Their benefit levels may be understated relative to other exporters whose separate projects were completely combined. Properly combining exporters provides a clearer picture of the top exporter beneficiaries of the Bank’s activities. Once formatted, the combined approved amounts dedicated to each exporter were ranked from largest to smallest to determine the top ten beneficiaries in each category. 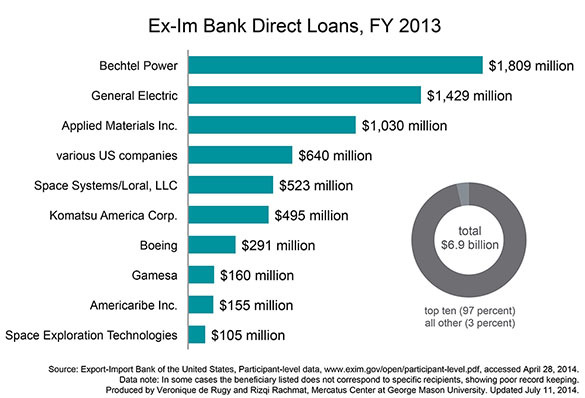 The first chart displays the top ten exporter beneficiaries for all combined Export-Import Bank interventions during FY 2013. 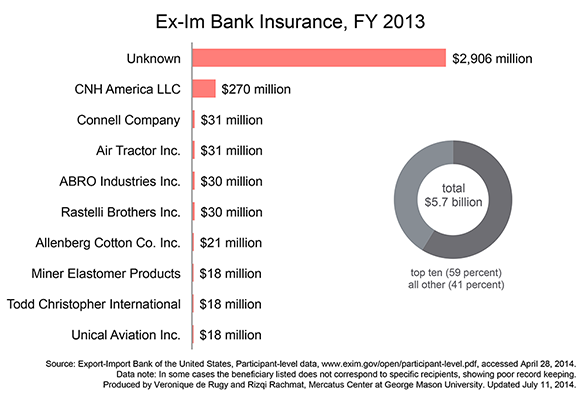 The chart shows that the Bank truly lives up to its nickname, “Boeing’s Bank.” Boeing was by far the biggest exporter beneficiary of all Bank activity, raking in over $8 billion in assistance during FY 2013. The Bank’s second top overall exporter beneficiary is alarming: the Bank’s data simply lists several exporters as “Unknown.” A later chart shows that most of these unidentified exporters benefit from insurance assistance. 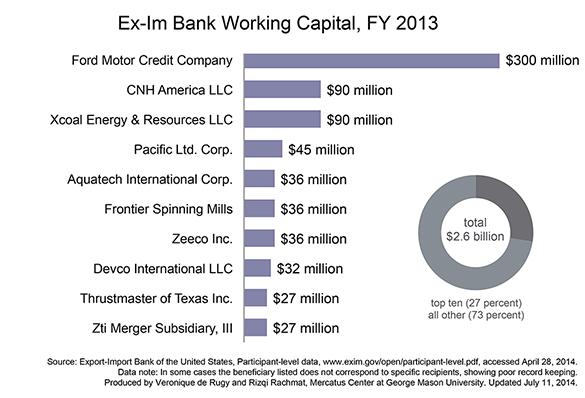 At least for now, almost $3 billion in Ex-Im activity cannot be accounted for with this dataset. Other heavy hitters include General Electric, which enjoyed roughly $2.6 billion in assistance; Bechtel Corporation, netting a healthy $1.8 billion in support; “various US companies,” another mysterious bunch, enjoyed almost $850 million in vague government benefits; and Caterpillar’s $1.35 billion in total benefits was boosted by a $1.3 billion loan guarantee to subsidiary Solar Turbine Corporation. The next four charts display the top exporter beneficiaries of the Bank’s separate loan guarantee, loan, insurance, and working capital guarantee products. They all show a similar trend: Big business wins big, and much of the Export-Import Bank’s activity is only vaguely accounted for—if at all. For example, the second chart focuses specifically on loan guarantees. 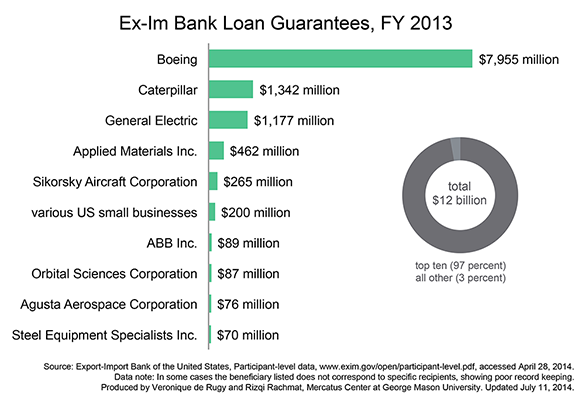 Boeing, Caterpillar, and General Electric are big beneficiaries here as well, taking the top three spots with $7.9 billion, $1.3 billion, and $1.1 billion in exports aided by Export-Import Bank loan guarantees. Technology and aerospace companies figure heavily in this category. Sikorsky Aircraft received $264 million in guarantee benefits, electrical equipment company ABB enjoyed $89 million, Orbital Sciences Corporation received $87 million to boost its space technology business, while Augusta Aerospace received $76 million. Those mysterious “Various US Companies” appear here again, with $200 million in vaguely-accounted-for Ex-Im benefits. These charts suggest that while not all US exporters benefit from Export-Import Bank assistance, the ones that do often benefit handsomely. 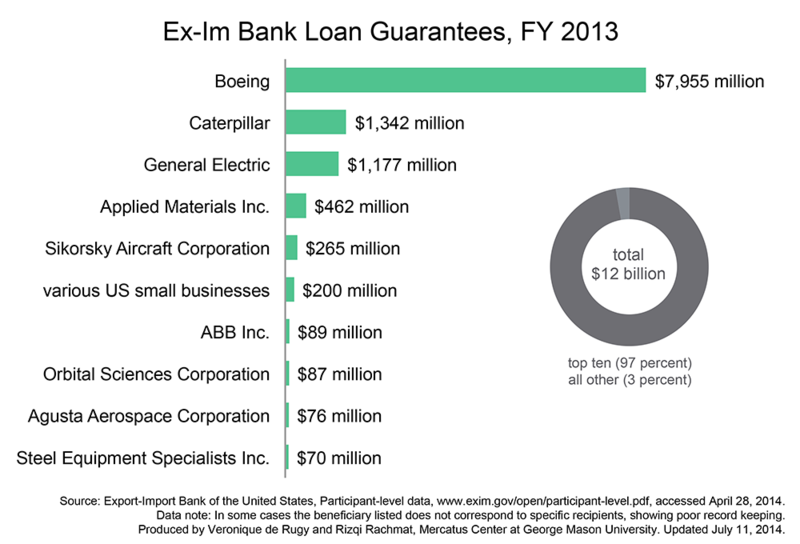 Boeing, Caterpillar, General Electric, and the rest have a large incentive to keep the Export-Import Bank running, despite the fact that the Bank’s own leader, Fred Hochberg, has publicly admitted that these firms can “arrange their own financing” without the Bank’s help. These special interests do not mince words about their intentions. Lobbying and industry organizations like the US Chamber of Commerce, the National Association of Manufacturers, the Aerospace Industries Association, and the Nuclear Energy Institute announced last week that they will launch an “all-hands-on-deck effort” to keep the Bank open for the benefit of the businesses they represent. Past reauthorizations of the Export-Import Bank have succeeded largely because they have flown under the radar. Meanwhile, there is no lobby for the taxpayers who are forced to subsidize these corporate profits.